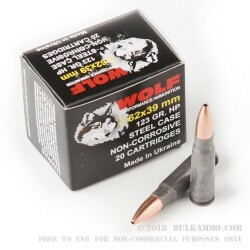 This 7.62x39mm cartridge by WOLF Performance Ammunition features a Berdan primed steel casing. Steel is far less expensive to make casings out of than copper, and these 1,000 rounds’ attractive price tag certainly reflects that. The trade-off with steel cased ammunition is always that it is non-reloadable, however, but if you don’t intend to handload anyway -- or just want to spare your lower back the trauma of bending over to pick up a small mountain of casings -- then this is a great investment for your AK-47! This cartridge sports a 123 grain projectile, which is the original weight for its caliber. 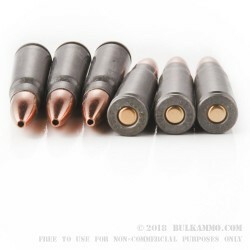 The bullet has a full metal jacket to protect your bore against lead fouling, and a hollow point for devastating terminal performance should you decide to go on a Soviet hunting trip. 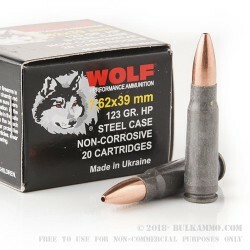 Unlike WOLF’s usual ammo, these cartridges are made in Ukraine. Their quality differs in no way from WOLF’s typical fare. Always works in my Ruger Mini 30. Never have any problems jamming or misfires. Q: Are the steel casings on this ammo coated in polymer or later? Thanks in advance for the information! A: Hello Idris! 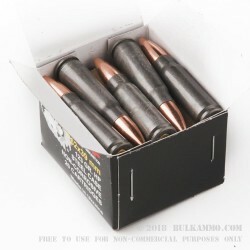 These rounds have a polymer coating on the steel cases.